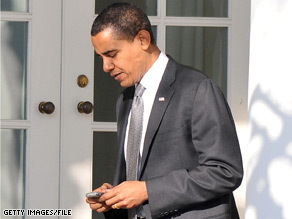 President Obama, who sports a special PDA since being sworn in, named his administration's chief information officer just last week. WASHINGTON (CNN) – After just a week on the job, the Obama administration’s new chief information officer is taking a leave of absence until further notice. A White House official tells CNN that Vivek Kundra is taking a leave from his post at the Office of Management and Budget until more details become known about an FBI investigation that resulted in a search of his former work place. A law enforcement source with knowledge of the investigation told CNN that Kundra is not involved in the case. processes. We can only hope that the entire cabinet will be filled before year end so the Govt. can go on vacation. It was interesting to read through the comments last week on all the blame that was placed on President Obama for the stock market falling. By the nutty right wing logic, shouldn't President Obama also be blamed for the stock market now showing gains? I would think it was neccessary for him to take "leave" while the FBI combed through all info in that office for indiscretions..He wasnt even implied to be "guilty", his subordinates were, maybe FBI is looking for info left behind from Bushs administration...give it a break folks, we DONT have all the info yet ! This is a good thing. At least we know that they are making sure that people that fill positions are clean and if not they are out! Unlike the Republicans. That is why the Republicans are all angry about regulations, they wont be able to hide their crooked ways. @KS Hawk – You made the point perfectly without even realizing it. If the investigation was happening during the Bush administration, why did Obama nominate Kundra for the post? How come this did not come up during the Congressional hearings? Do you think Kundra is the only person qualified for a CIO position? Did any of you Obama bashers even read the article? It said......that Kundra IS NOT involved in the case. Geez, don't be so eager to point fingers. That is why the Republican Party is so disfunctional now!! If you set the bar higher not as many will be able to jump over it. I am sure all those in the Bush administration were good enough, but let's face it good enough for that crowd wasn't good enough for America. You Obamaphobes out there can keep trying to sell the standards as a negative but the American people aren't buying it.